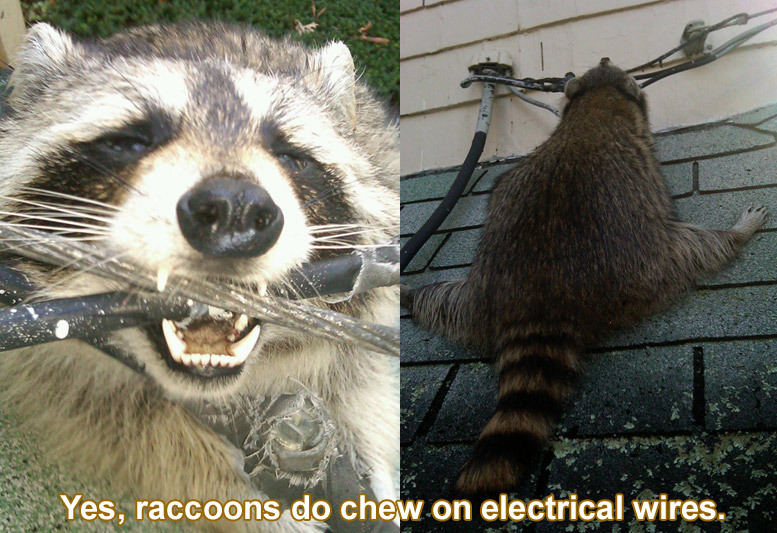 Do Raccoons Chew on Electrical Wires? I used to believe that raccoons did not chew on wires. I didn't think they had any reason to do so. Typically, chew marks on wires are a result of rodent activity. Rodents, which include squirrels, rats, and mice, chew a great deal. Actually, they gnaw, a habit of keeping their ever-growing teeth in check. They gnaw on all sorts of surfaces, including wires. 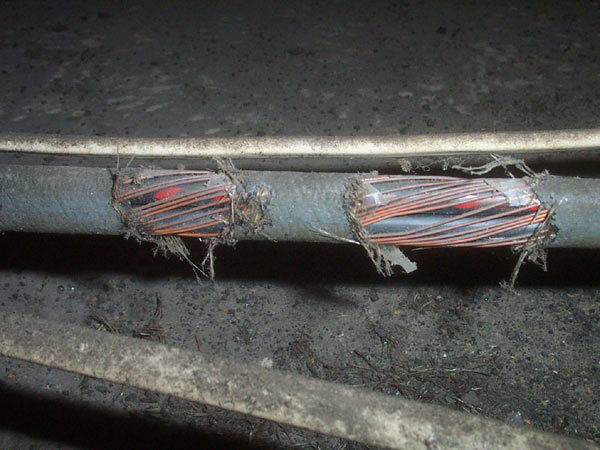 They often create a fire hazard, by exposing the copper inside the insulated wire. This current gets hot, and can set fire to wood or other flammable materials in an attic. Good statistics are hard to keep, but it's well-known that a large proportion of fires are a result of animal activity in an attic. I used to be under the impression that raccoons, which are omnivores with set teeth, did not gnaw. Typically they don't. They cause damage with their strong and nimble claws. However, in my years of trapping raccoons out of attics, I have repeatedly seen irrefutable evidence that raccoons do gnaw on wires. I don't know if this is the behavior of adult raccoons or the juveniles, but it happens. I have seen many cases in which attics were completely free of rodent droppings (the sure fire way of identifying animal presence in an attic), and yet the wires near the raccoon nesting sites had been chewed. Look at this photo. Note the raccoon tracks in the dusty area behind the wires. This attic had no rat or squirrel droppings. Only raccoon droppings. I trapped and removed a mother raccoon and her litter of young. This was the first report the homeowner ever issued about any kind of animal noise in the attic. My only conclusion is that the raccoon did this. It makes enough sense, I suppose, because I've seen attics full of insensible raccoon destruction - ducts torn, insulation pulled off of pipes, support beams chewed and torn, etc. This particular chewed wire is not a fire hazard, but some cases are.